While there are plenty of misconceptions about technology out there, telematics has become a common business tool for industries like transport and construction. These telematics systems are diverse and vary between industries, these myths can stop businesses from implementing the technology. Whether it’s getting the most out of their telematics data or being dissuaded from installing the technology altogether, here are some of the biggest telematics myths – debunked. 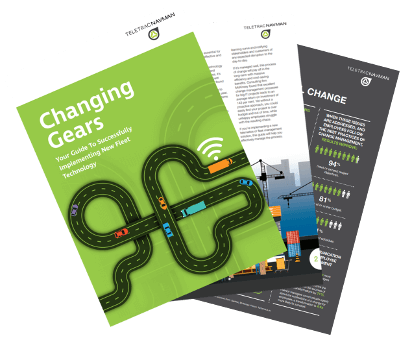 Changing Gears; your Guide to successfully implementing new fleet technology. Download the free eBook today to help guide you through the necessary steps you should take to implement telematics in your business. When you manage a fleet, keeping spend down and fitting to budgets is an ongoing battle. It’s understandable for you to be concerned about the cost of new technology. Depending on the number of vehicles, the industry you operate in and the goals you’re looking to achieve, there are ample options available to fit your budget. Telematics isn’t a one-size-fits-all solution and shouldn’t be treated as so. A solution is often easily adapted to fit your unique business needs, to ensure that you get the services and features that your business needs. Tracking behaviours that contribute to excess fuel loss, such as idling and harsh usage, can help reduce overall fuel spend. Using a fuel tax credit (FTC) solution based on real-time GPS location data to more accurately calculate your claims and get a higher rebate. Monitoring driver behaviour and implementing real-time alerts for behaviours, like speeding or harsh cornering, not only make your drivers safer but cuts costs on insurance premiums. Telematics isn’t a one-time, “set and forget” solution. To make your workplace healthier and safer, it’s up to everyone, from drivers to senior management, to act on the insights and improve everyday operations. The technology collects data from your vehicles, equipment and operators so you can proactively identify and mitigate risk and address issues as they arise. For example, if the system is flagging an ongoing behavioural issue with one of your drivers, such as regularly exceeding speed limits or harsh driving patterns, you can work with them to improve driving behaviour. Or, if certain vehicles (or equipment) aren’t in-use for long stretches of time, they can be moved to where they can be utilised more effectively. Telematics gives you the tools, but only by understanding and acting on the data can it be used to its full potential. The level of assurance and service your provider can guarantee. Understanding the difference between hardwired devices and the software. Knowing the goals you wish to achieve for the business and how telematics can help. You also want to ensure that your solution abides by strict quality control and is in-line with the National Telematics Framework. Only then can you accurately collect and assess the evidentiary data required to have true visibility over your fleet. If you’re caught out in an on-road incident, you want to be able to look up exact times and locations and know the solution has been recording. During an audit, you need to pull up records instantly and demonstrate that they’re accurate. With a high-quality solution you can have complete confidence that your data isn’t up for debate. At the same time, it’s important that it isn’t a burden to use. An easy-to-understand interface that allows staff to export reports and collect the exact data your business needs is imperative. You want a system that works with your business, not against it. Ultimately, after the initial learning curve, telematics should make life easier for everyone across the organisation. It’s only natural that any potential pushback from your drivers would make you hesitant about implementing telematics and a new way of doing things. However, with the right education and transparency about what the technology does and why it’s there, you can bring drivers and office staff on-board and dispel any misunderstandings they have. This could through hosting regular toolbox meetings where they can ask questions, bringing in experts to run through the technology, and showing staff exactly what data management and admin can see. At the end of the day, telematics is there to improve the safety and wellbeing of your drivers and reduce the amount of paperwork and manual tasks across the business. Making this change means you’re not turning a blind eye for the sake of keeping the peace, but instead taking active steps to make the workplace safer. Highlighting the benefits of the technology for everyone will align your business around a shared goal. Even if your business has only one or one hundred vehicles, it will still benefit from telematics. Technology provides opportunities to be more efficient and improve customer service. For example, it can make your billing and invoicing processes far more accurate by tracking exact times you were on the road. If a customer wants to know the exact ETA, your driver can send their real-time location at the start of the trip that the customer can view at any time. There’s no need for them to try and contact them and potentially delay the trip. This is also helpful if your business operates in remote areas where mobile coverage is low, as access location data is accessible regardless of network quality. Don’t get caught up in hearsay or misconceptions – telematics is an essential technology for a modern fleet and can be a life-saver as a fleet manager, helping to streamline your operations and increase your bottom line. With the right information, you can more clearly assess your options and find the best possible solution for your business. Download the free eBook today to help guide you through the necessary steps you should take to implement telematics in your business.